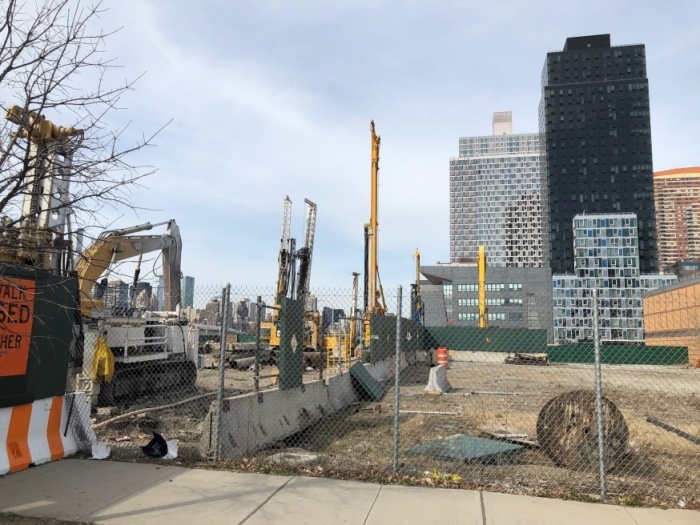 A ceremonial groundbreaking is taking place next week to mark the start of construction at Parcel C of the Hunters Point South development. The groundbreaking, to be held April 5 by developer TF Cornerstone and an array of officials, represents the beginning of the development that will see two residential towers rise, referred to as the north and south towers. The north tower will rise 55 stories, or 550 feet, while the south tower will be 44 stories, or 440 feet. In addition to the towers, there will be a separate stand-alone 572-seat elementary school on the site and a ground level playground. Council Member Jimmy Van Bramer said the development will include many features residents have been asking for. “Parcel C will bring a brand new elementary school and playground, hundreds of affordable housing units, a community center and public open space that will greatly benefit our community,” he said. The two towers will bring nearly 1,200 rental units combined, 800 units deemed affordable. The north tower will include 800 units, of which 534 will be affordable and 100 of those units reserved for seniors. Approximately 8,000 square feet of space in the building will be reserved for commercial use. The south tower will house 394 units, with 263 of those units classified as affordable. The tower will hold approximately 6,316 square feet of commercial space and an 8,000 square foot community center. The towers will be located flush against the perimeter of the parcel, as will the elementary school. 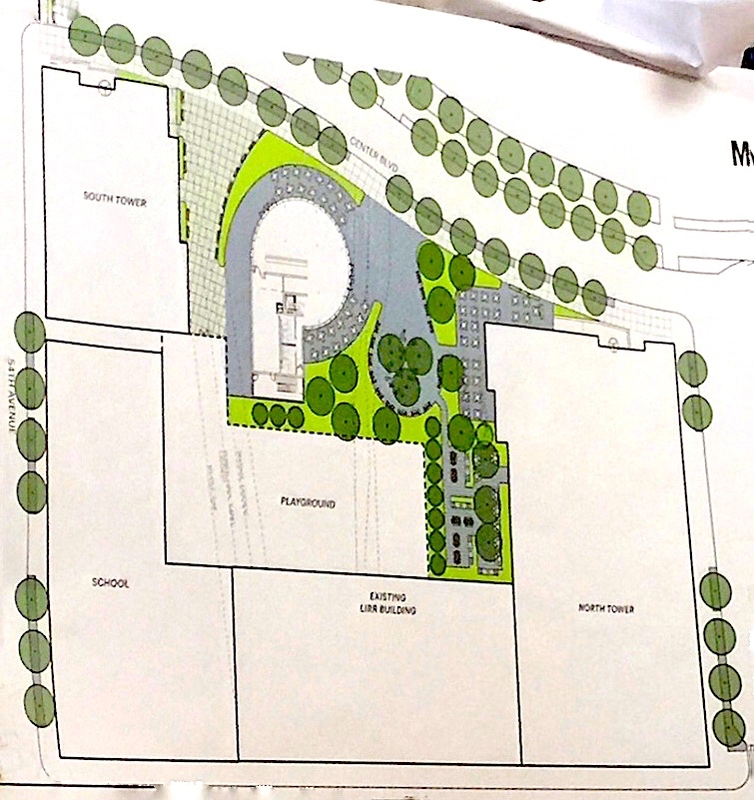 There will be a cleared-out space in the middle of the site for the school playground and public space that goes toward Center Boulevard. The project has undergone a series of delays stemming, in part, from the complex infrastructure running below the site. The design had to be changed to make way for Amtrak tunnels and the powerlines below, as well as the late addition of the school. The groundbreaking is a significant step in the massive, 30-acre Hunters Point South development. The greater HPS development will bring 5,000 housing units spread across seven parcels from 50th Avenue to the Newtown Creek. Parcels A and B were completed by Related completed in 2015, bringing 925 units and an 1,110-seat school. Parcels D and E are currently being used for construction staging while the other sites are being developed. The city will eventually issue a request for proposals to seek development plans for these sites, according to the NYC Department of Housing Preservation & Development. The city has selected a development partners for parcels F and G. Last year, real estate firm Gotham and non-profit Riseboro Community Partnership, were picked by the city to bring 1,120 units to be spread out on the two parcels. Of the units, 900 will be permanently affordable, including 93 for seniors. There will also be a standalone elementary school. The parcels are located on the southernmost portion of the development and are flush along 57th Avenue and 2nd Street. 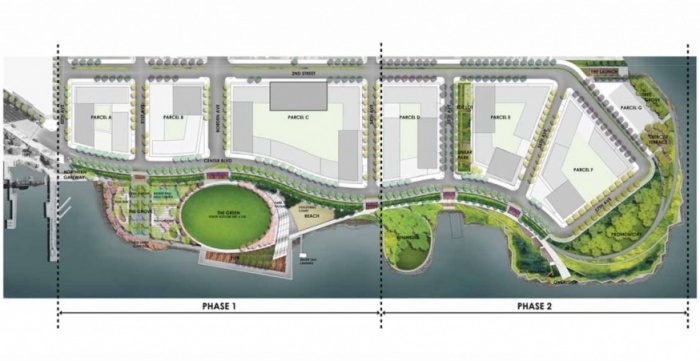 During the process, the first phase on Hunters Point South Park opened in 2013 and the second phase in 2018. The combined park is now 11 acres. Amazon was going to be a burden on the infrastructure but the over development of Hunters Point south isn’t? What a joke. Where are the protesters now? JVB? AOC? I bet these buildings get built in a faction of the time the library will have been built, if it is ever done. A case study why, when people say the government should take over anything, most of us get queasy. What will happen to CityLights among all of this? They have huge financial issues and mounting maintenance costs, which would continue to increase by another 21% for three years. The units are in pretty bad shape, esp the higher floors. Water pressure issues, leakages, bugs etc etc. It is a case study of caution. Ed, the Citylights issues have been blown out of proportion by a small group of residents who don’t want to pay property taxes after riding free on a tax abatement for 20 years. They call themselves “pioneers” because they were the first to move in (and are sitting on 1000% profits). Most of them live on the higher floors (penthouses with panoramic views of Manhattan). Maintenance is going up to pay the taxes and will level off once taxes are fully phased in just like it would for any other building on an expiring abatement. This has been in writing for two decades. It is not a surprise. And the tax revenue is needed for the community improvements we all love to talk about like transit, schools, etc. Also please note the building itself is not in disarray… brand new tennis court and green roof in development (supported by a grant from the city), updated health club with exercise classes and a sauna, updated laundry room with new equipment, new water tank and filtration system, repaired parking garage, and elevator modernization in the works. This is actually a success story… an economic development program led to a boom in LIC with Citylights leading the way. It’s unfortunate the message has been twisted into a sob story that does not reflect the reality of the building today. How about a baseball field for little league. This area is severely lacking in baseball fields. Though I do agree we should have more green spaces for sports, Queensbridge does have a couple of baseball fields not too far away and Randall’s has a ton. You can never really have enough though. The FAKE MRLIC wrote the March 28, 2019 comment on Luxury Condos. We don’t need any more Development in LIC it was Overkill a few years ago. We need more transit !!!!!!!!!!!!!!!!!!!!!!!!!!!!!!!!!!!!!!!!!!! Agreed, these developers are out of control. Can you believe some people voted for one for president ?!!!!!!!!!!!!!!!!!!!!!!!!!!!!!!!!!!!!!!!!!!!!!!!!!!!!!!!!!!!!!!!!!!!!!!!!!!!!!!!!!!!!!!!!!!!!!!!!!!!!!!!!!!!!!!!!!!!!!!!!!!!!!!!!!!!!!!!!!!!!!!!!!!!!!!!!!!!!!!!!!!!!!!!!!!!! We could build a prison here next to the condos! Great news, “more luxury condos” I always say.